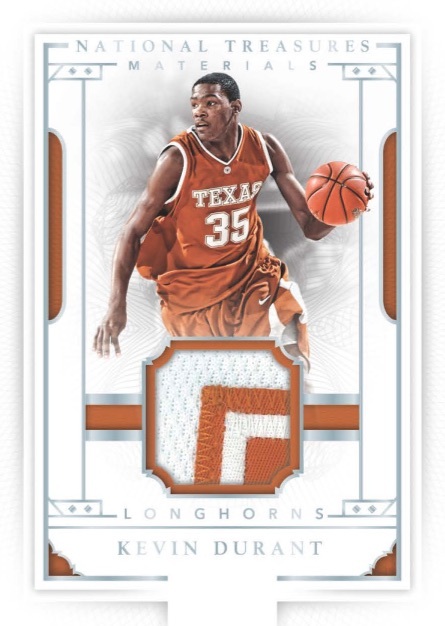 Branching out from the multi-sport NT release, 2016-17 Panini National Treasures Collegiate Basketball solely covers the NCAA hardcourt stars. Hobby boxes contain up to eight total hits. Falling two per box, the 45-card base set is limited to 99 copies with Silver, Gold, Black and Blue parallels, each numbered to 25 or less. Other than that, the high-end college set is all about the premium inserts. 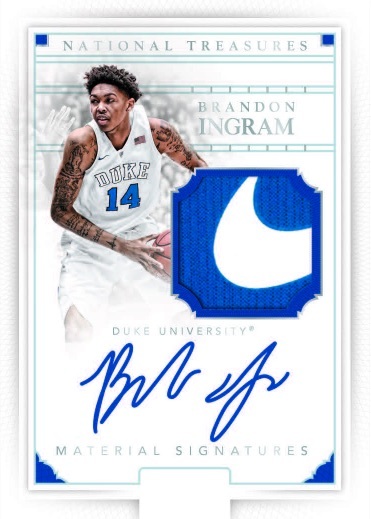 Looking to the key NBA rookies for the 2016-17 season, Material Signatures features on-card autographs and quality memorabilia pieces. The Brand Logo parallel is numbered to just two copies. 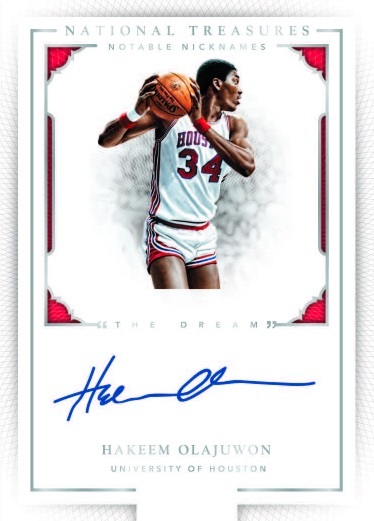 Colossal Signatures and Signature Die-Cuts also showcases hard-signed rookie content. 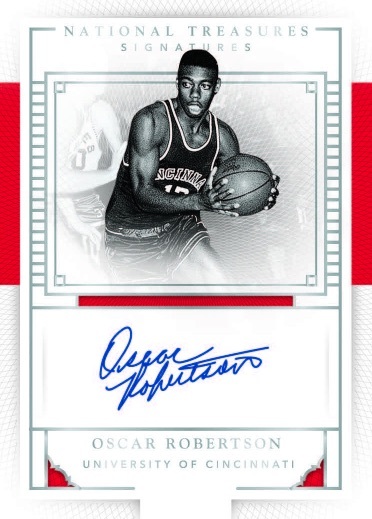 Not just about the most recent college players, 2016-17 Panini National Treasures Collegiate Basketball features several other signed sets that cover earlier stars. Team Logos highlights the school were each player honed his craft while Notable Nicknames takes inspiration from the on-court personas of the all-time greats. Working with 12 players, the Signatures inserts are numbered to 25 or less and include Printing Plates (1/1). Another rookie-centered insert is Combo Player Signature Booklets, this time in a book-card layout with multiple relics and an autograph. 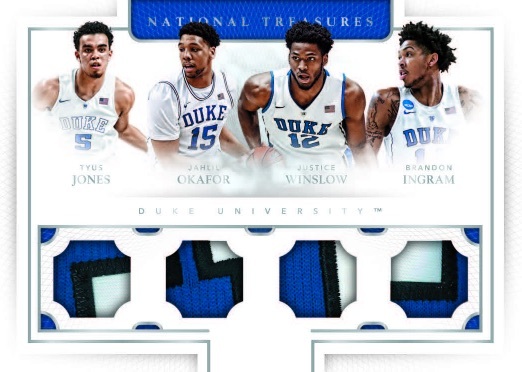 The other main component besides autographs, 2016-17 Panini National Treasures Collegiate Basketball also promises some quality memorabilia cards. Documenting top stars, Materials applies game-worn college uniforms from past and present. Increasing the players per card, Brand Logo Duals and Team Quads both pack multiple swatches on one card. Prime versions substitute more rare relics. The product is out now but we are still waiting on the checklist. The full checklist will be added as soon as it is available. 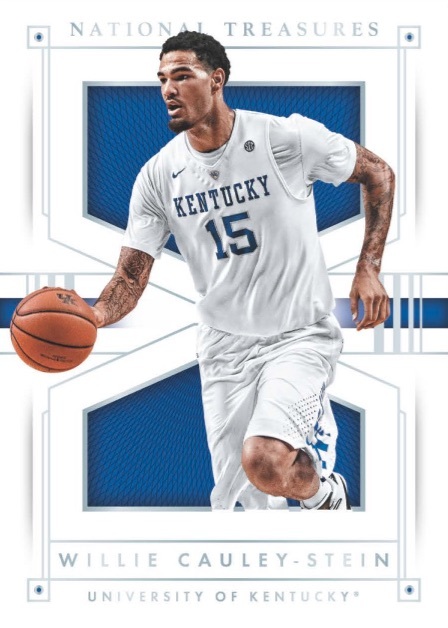 Shop available 2016-17 Panini National Treasures Collegiate Basketball cards on eBay. Panini doesnt like giving out checklists do they ? Pulled a 2015 RC Rashad Vaughn relic auto #370 in a box of 2016-17 National Treasures. Is that normal?